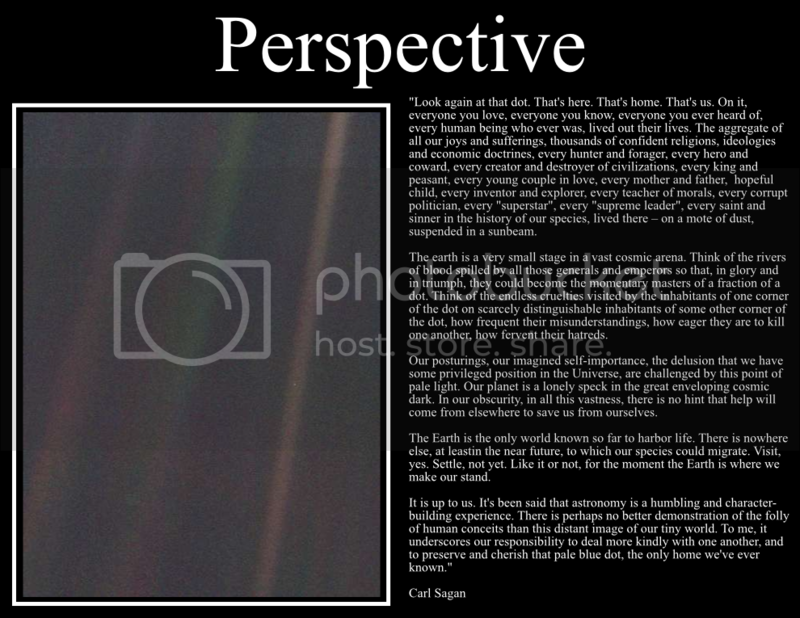 When the Voyager 1 probe was heading out of our solar system Carl Sagan requested that the camera be pointed back at Earth to take a snapshot of our planet from a record distance. You can see the pale blue dot caught in a sunbeam in the photo below. The photo just may be the most important photograph ever taken because it gives the inhabitants of Earth a perspective that they need to see in order to understand how delicate they are and how important it is to care for each other. Here is what he writes on the photograph. That is pretty impressive to say the least. If only people would care. This is one of the reasons why I have always supported astronomy and space exploration. I mean, look at how tiny that dot is in the photograph. Every human who ever lived, went through life living on that dot. That's billions of people. Only a little more than 500 people have been to Low Earth Orbit and only 24 people have broken Earths Orbit and gone to the moon. That's it. The moon is so small, you can't even see it in the photo. Now imagine an asteroid heading for that pale blue dot. Would that give a reason for the billions of people to work together? Only time will tell. The Earth has gone through mass extinction level events before, but for the first time there is a life form that can prevent its own extinction. They just have to learn to swallow their pride first and reach out a hand. I also think we will cause our own extinction. Has a life form ever been capable of that? Seeing that photo makes me want to explore our earth more. It's so small but so imposible to live in. Why are we restricted to go where we choose? Why are there governments,wars,polutions,right and left,religion,the east and the west,curency. Why do we burn our own food supply to make fuel? This world is getting smaller every day. It's a war of ideas that will save us. Unfortunatly Some people will tell you they are right and you are wrong. People will never agree on everything. We are also capable of putting off our own extinction. We have ways of transportation that have no bi-product. Cars that are run on batteries that recharge under a solar power ports. Large rockets that can push an asteroid off course, preventing it from hitting Earth. Medical research that finds the cure for disease. People just aren't reasonable. We are capable. But we all think difrently. What one person sees as saving the world another sees as destroying it. not useing trees as a resourse is a hudge mistake. It's one of the greatest renewable energy sourses we have. Plastics I think will be the death of us. Yes cars may be lighter and more economic on gas or even non gas. But plastic comes from patrol and I thought thats what we were trying to get away from. It's just another product, just another gimmick for people to buy into. Go Green! What a trend, What a Gimmick! I love the earth more than just about anything. To see polutions makes me sick. One day there will be wrecking yards piled with plastic cars rotting for the next 10,000 years. Organics are the way to go if we are going to save the earth but nobody cares. Like I said. Battery power is the way to go if we are going to continue to build cars and solar power is the way to go to recharge those cars. I think as carbon fibers get less expensive, most cars will be made out of that. It is much lighter than steel but many times stronger. You are right about us getting off of petroleum in all ways. Plastics can be recycled but in many cases it is more expensive to recycle the product into something else. I also do believe that if we are to improve air quality we need to save some room for the trees. We re seed after we cut down but less seeds actually make it to germination than there are trees being hauled away. The third option in a grocery store line is the better one, reusable cloth bags. Mandi and I have a ton of them and we wash them to keep them clean. I also believe that humans have had a major impact on the climate of the Earth since the industrial revolution. I know the climate has changed many times in the past but we are speeding it up. I tech for a meteorology class here at the university ant the results are there, some just choose to ignore them. Now I'm not talking about Global Warming, I'm talking about the ice caps decreasing in size much more rapidly than they ever did in the past, and the effect that has on the climate. EX: more earth quakes, more flooding, more tsunamis, heavier snow storms etc. The ones who don't believe have something to lose in the process. I know I'm to blame as well but I'm going to try to do a little better. For one, I don't really see a need to keep my Rambler. It's a fun car but man that thing eats up gas. I may just go with another bug. They actually have electric conversion kits for those and they are made of lightweight metal, not plastic. I love them because they have everything you need, nothing you don't. I know I have a lot of strange ideas and I know I sound pessimistic about the human race. But what happens when the world cannot sustain billions of people anymore. We have the capability and the means to feed everyone on the earth right now but people are dying of starvation. Do we expand our race beyond the earth? Do we go to Mars? That sounds like science fiction but we know it's possible. People will think anybody that talks that way is crazy. Bicycle Tires, Guitar Strings,Dyes,Car Battery Cases,Yarn,Candles,Hand Lotion,CD's & DVD's, Paint Brushes,Sun Glasses,Paint,Hair Coloring,Surf Boards,Tents. Yet they all protest the oil companies from producing more petroleum. One 42-gallon barrel of oil creates 19.4 gallons of gasoline. The rest (over half) is used to make things like those above. Everyone is a hypocrite to me even myself. We have created a world in my opinion that does not make life easier but more convenient. The world I want to live in is one where we use glass and rock and trees and mud. Anything non destructive to the earth. I know I sound like a stupid hippy. I am not one. Just over one hundred years ago people lived this way. On the other hand plastic and petroleum save peoples lives. I can't argue that. I don't like to think about it because right now I am emailing you from a plastic computer. I wish I knew what was best for this world. I wish I knew how our future would turn out. From my point of view it doesn't look good. I hope for the better but you have to see things and people the way they are. Wow! I wrote a lot. I think the best way to solve things would be to either have population control, or to relieve the population from pressure by expanding human life into space. The more planets you have to pull resources from, the less stress you have on just one. Because of population increases, natural resources like trees cannot sustain the human population. If we keep burning oil, the same thing will happen. If we keep polluting our waters, the same thing will happen. So my assessment would be to expand our boarders out to other planets. Our own galaxy potentially has billions of planets. If we focused our efforts on new ways of propulsion we can get there. It's going to take a major disaster to get people thinking in the right direction and it will take a lot of incredible engineers, geologists, and physicists to get us there. Money isn't an object when people have to rely on each other and share resources. A common objective, save humanity! yah that is great. Thats what I think we should do but poeple think it's science fiction. I think the threat is real. And how do you controll the population? I know they do in China but it's China! If saving the world meant loosing freedoms would it be worth it? Would anybody even want to live anymore without freedom? No longer free to pursue dreems or free to use more than one sheet of toilet paper anymore? Free to eat how much food we want. Free to choose between western family cheese and gossner? Or will it be a one world government cheese. People will not be allowed to think or choose for themselves. People will have to submit. All people everywhere will have to be on the same page. Can you imagine everyone just agreeing to it? I don't think I could do it. Like thx or 1984. Those kinds of stories are real. I agree. In order to have progress, you must have opposing ideas. If there were nobody around to challenge science or religion we wouldn't be as far as we are now. The problem is there is so much opposition that nothing gets done. Nobody wants to make compromises. I wish that I lived in a society of "reason". A society where the rules and regulation posed on its people made sense. I believe that the most understanding people in these matters are the astronauts who have lived on the International Space Station. There are 6 who live up there at a time and you can have a Russian, Canadian, American, European, Indian and many other nationalities orbiting the globe, passing over all territories many times a day. You see no borders, only land and water. You are separated from the rest of humanity. I wish I could leave the earth for a while. Only the privaleged few can have that great experience. I don't think anyone can fully understand that concept untill they have had the chance. My perspective (being religious) is that Christ will come to save us all. That doesn't mean that we don't do anything but wait. I think as stewarts of the earth it is our responibility to keep it safe and use it wisley. On this we can agree. No matter what your belief we all know somthing needs to be done for our future. Is the cost of settling another world cost effective and justifiable? That is a good blog. I read this many years ago in the book of moses and it hit me hard. Very hard. I think we should use trees sparingly and with thanks giving That is how the native americans saw trees and animals. Nate and I are talking about going hunting next year. I think it's important because we take things for granted. How many animals have I ate this year? How many have I wore on my feet? I want to know what it's like to take away life. I want to feel for what I am eating. Not chew devour, chew devour. Just this last year when I was out in California, Maria Roddy decided to tell us a story before we ate a delicious pork dinner. It was a story about a young native American who wanted to go out hunting with his father in order to show everyone how much of a man he was. He wanted to bring home a prize to show to the village. So he took his son out and when his son shot a deer with his bow and arrow, he was proud and he gloated. His father took his son and told him that he had just killed his brother. That in order to survive he had to take the life of another. There would be no prize to take home. Every part of that deer would be used. They said a prayer to thank the deer for giving its life in order for them to live. I too want to go hunting some day. I hear it is a humbling experience. I also want to know what it is like to have to skin it, and cut the meat off. If you can't do that, you don't deserve to eat meat. At least that's how I feel.